Ballymena United manager David Jeffrey congratules two-goal hero Francis McCaffrey on Saturday. 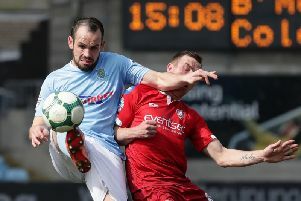 Pic by PressEye Ltd.
Ballymena United boss David Jeffrey singled out Francis McCaffrey for special praise following a 2-0 victory. McCaffrey arrived at The Showgrounds in the summer but the opening five months of his career have been disrupted by injury. However, the former Glentoran ace bagged two goals in five minutes to see off basement side Portadown. McCaffrey popped up in the penalty area on 58 minutes to convert the loose ball after a dangerous Tony Kane cross. His second provided a superb finish to a flowing move when Leroy Millar’s crossfield pass was steered into the path of the supporting McCaffrey by Willie Faulkner. “The first goal was great anticipation from Francis and exquisite football for the second,” said Jeffrey. “Francis has had a torrid, torrid time, injury after injury. “That’s the reason why he ultimately left Glentoran after 13 goals from the middle of the park previously. “He’s had an awful time but came back into the group last week his contribution today was first class. Niall Currie is expected to be officially named Portadown’s next manager tonight and coach Trevor Williamson highlighted the progress of two young players as the main highlight of another frustrating afternoon.